Whalen's Wanderings: Rainy Day Blues?? As much as people often gripe about the rain, deep down we all have a deep appreciation of it. Most people now don't live in a metal roofed house, at least not here. Metal roofs are making a come back though and everyone will tell you they love the sound of rain on a tin roof. Me, I love the rain on my tent. It is a calming sound that often lulls me to sleep while I read the latest trail guide or bird id book. I don't even mind having to wander out of my tent to pee in the rain. I love the feel of cool drops on a dry thin t-shirt. The cold drops seem to touch my inner body and sooth the aches I developed through my long hike, and it seems to happen in slow motion. The smell of the rain on the ferns permeates everything around me and makes its way into my stuffy tent even. This scent of renewal even overpowers the smell of my sweaty socks which I have hanging in my gear loft and makes my tent more bearable. I battle to break camp and carry on my way as I just want to sit in this scene of serenity and literally soak it all in. I finally pack up and start my day off in the constant drip of the woods. Each step takes on the rythym of the rain and before long I am singing in my head..."I'm singing in the rain, oh I'm singing in the rain..." On a day where most people are griping about the weather I am out here living it up and enjoying it. Rainy days like this prove to me that backpacking, and outdoor adventure takes a special mind set, and am I ever glad I'm crazy. My picture this week was taken after a rainy day along the Fundy Footpath. 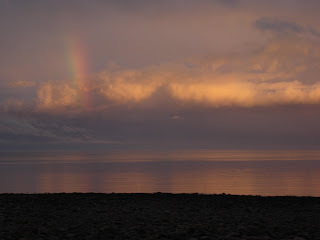 When the sky cleared just before sundown it revealed a double rainbow extending straight up off the Bay. It was a surreal moment when the earth seemed right and all those worries of work, economics, and environmental struggle just faded away.